For Cultural History since 1750, KU Leuven is looking for a postdoctoral researcher who will work in the framework of the EOS-project ‘B-magic. The Magic Lantern and its Cultural Impact as Visual Mass Medium in Belgium (1830-1940)’ on the subproject ‘Between Instruction and Delight: the Magic Lantern in the late 19th- and early 20th century Belgian Visual Media Landscape.’ You can apply for this job no later than July 21.The Research Group Cultural History since 1750 investigates the history of knowledge and science, historiography and historical culture, and cultural infrastructure and cultural transfers. Within the domain of history of science and knowledge, attention is paid to the production, circulation and cultural meanings of knowledge and science in the public sphere. Themes such as the formation of disciplines, science popularization, knowledge transfer in education, visual culture and the role of gender and corporeality in the history of science and knowledge are explored. Click here for more information about the research unit. B-magic isa four-year EOS-funded project which will be conducted at two Flemish (UAntwerp and KU Leuven) and two French-speaking universities (ULB and UCL), in collaboration with an art college (KASK Ghent) and an international partner (UUtrecht). 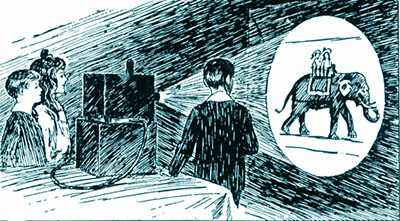 The project will write the history of the magic lantern as a mass medium in Belgium. The lantern was the first visual mass medium to contest the printed word as a primary mode of information and instruction. The B-magic consortium will research the pivotal role of the magic lantern in Belgian society from the country’s independence in 1830 up to 1940, when its use declined. To this end, it brings together an interdisciplinary team of researchers from Performance Studies, Cinema and Media Studies, Urban History, History of Science and Knowledge, Communication Studies, Semiotics and Narratology. For more information and other available vacancies see www.B-magic.eu. The successful candidate will work on a sub-project entitled ‘Between Instruction and Delight: the Magic Lantern in the late 19th-and early 20th century Belgian Visual Media Landscape’. In order to better understand the changing role of the magic lantern in the rapidly transforming Belgian media landscape of the late 19th and early 20th century, this project will investigate its distinct contributions and links with other visual media in three different multi-modal contexts: it will explore the magic lantern’s relationships to wall charts and maps in education, and analyze the stylistic, technical and narrative interplay with dioramas, pre-film animation and early film in entertainment and in science. You have completed a Doctoral Dissertation in History, Cultural Studies or History of Science or an equivalent degree in which a historical perspective played a prominent role. You have a track-record of international journal publications. You have excellent writing skills, excellent reading skills in French and knowledge of (or a willingness to learn) Dutch, strong organizational skills and proven ability to work in a team. You are willing to communicate on your research at conferences, on social media and through publications. You are willing to play an active role both within the B-Magic team and the Cultural History since 1750 research group. We offer a three year postdoctoral research position in a young and stimulating research environment. The initial contract covers 1 year. After positive evaluation, this can be extended with maximum 2 years (in case of substantial postdoc seniority of the candidate, it will not be possible to cover the full three years). For more information please contact Prof. dr. Kaat Wils, tel. : +32 16 32 49 71, mail: kaat.wils@kuleuven.be. Candidates are invited to submit their application in English, Dutch or French, consisting of a cv, a letter of motivation stating the candidate’s qualifications and reasons for interest in the position, one writing sample (published article), the contact information of two references (including information on relationship with the applicant). Interviews with a selection of the applicants are scheduled in the week of August, 20. Candidates who are selected will be notified early August.